A brilliant performance from our young American sealed a superb second place in Saturday’s Sprint race at the legendary Assen TT circuit. 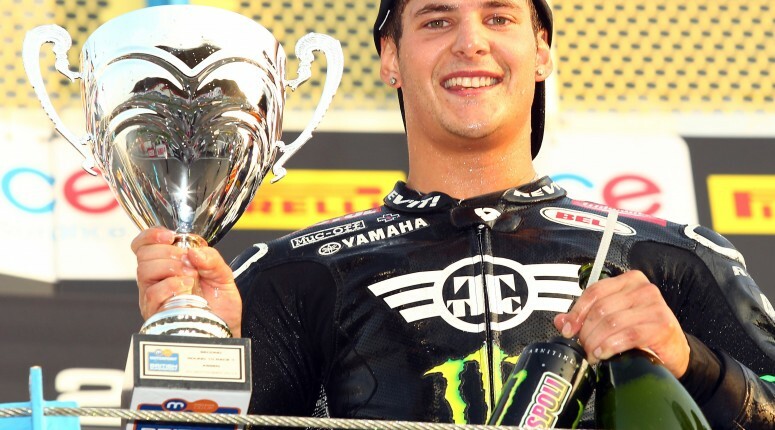 Team Traction Control’s Dutch debut delivered the team’s first Supersport silverware, with James Rispoli finishing second in Saturday’s Sprint race. Rispoli and his Yamaha R6 soon got to grips with the fast Assen TT track, bagging some quick lap times and enjoying a great late chase to decide which podium step he would eventually take. “The weekend for us was great from the get go. I really gelled with Assen. I love how fast it was,” says James. Our belief is paying off! “This is a tough series, no doubt about that, and to get this in our debut season is awesome, James rode really well and used his head, I’m proud of him today!” says Paul. As soon as the race finished Team Owner Keith Flint was on the phone to Paul as they made their way to the podium. “Flinty was buzzing, he’s made up,” says Paul. Sunday’s race was a mixed bag of fortune. Sterling work in Saturday’s Sprint race resulted in a season-best 5th place on the grid for Rispoli. But no sooner had the race started, it was red-flagged, meaning a restart. And with that came a dose of bad luck and the clutch being burnt out at the second start. Dropping back to 16th from the start was going to end the chance of another podium, with James battling hard to finish the race in 12th. TTC leave Assen with many positives: the set-up changes have worked, the bike power and speed is very good, and the whole team is delighted to come away with well-deserved silverware. “I just want to thank my entire team for all the hard work, and all the people who help behind the scenes,” says James. Now we begin preparation for Silverstone in two weeks and intend to take the momentum of the podium finish with us.